I love playing Holi. Since my childhood it has been my favourite festival. Since the last few years I have been using 100% natural colours and encourage those around me to shun harsh chemical based colours and embrace natural or organic colours. After all Holi is a festival of joy and it was never meant to be harsh on skin and hair. Natural Holi Colours from Rang de! This year I am planning to purchase natural colours from Rang de! These are made from 100% natural products. No chemicals whatsoever are used. Natural Holi Colours from Rang de! are made with spices and plants. 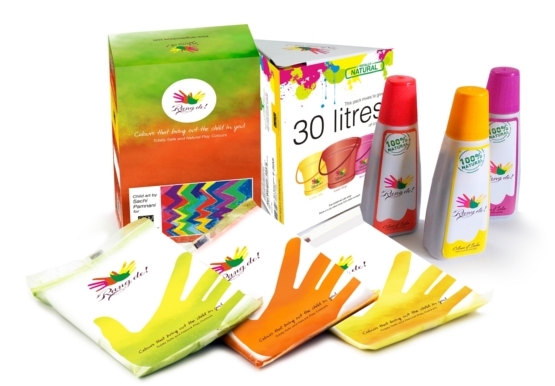 Natural holi colours are safe and are gentle on skin and hair. They are easily washed away. Made with plant extract and spices (like turmeric) these colours are also environmental friendly. Natural Holi powder colours from Rand de! is available in three colours – green, orange, and yellow and available in 300gm and 100gm packs. Liquid colours are available in orange, yellow, and purple. For price and buying online you can visit their website. Is this a new product and did it go well in the market ?